Public transportation will also be the focus of a special council meeting called for Monday, Dec. 10 to discuss a possible position on state legislation regarding a regional transit authority. A proposed resolution that councilmembers will consider asks Michigan Gov. Rick Snyder to veto legislation that would establish the four-county RTA, which would include Washtenaw County. The council considered a resolution that suspends the expenditure of funds set aside for public art until April 1, 2013. The city’s public art ordinance requires that 1% of all city-funded capital project budgets be set aside for public art. Left to right: Sabra Briere (Ward 1), Sally Petersen (Ward 2). The resolution referred to a committee the council had appointed, but at that point the committee had not been appointed. Later in the meeting, mayor John Hieftje put forward the names of five councilmembers for the committee: Sally Petersen (Ward 2), Sabra Briere (Ward 1), Stephen Kunselman (Ward 3), Margie Teall (Ward 4) and Christopher Taylor (Ward 3) The committee is charged with making a recommendation to the council by Feb. 15, 2013. The city council considered the resolution on suspending the program at its Dec. 3 meeting, after postponing the action at its Nov. 19, 2012 meeting. Also at the November meeting, the council had tabled two proposals that would have changed the public art program – one from Jane Lumm (Ward 2) that would have terminated it, and one from Sabra Briere (Ward 1) that would have narrowed the scope of qualifying projects. What the council was asked to consider on Dec. 3 was a resolution that prevents funding of any new art projects, but doesn’t affect any funds that have already been committed by a contract for a specific project. The suspension of funding does not apply to artwork for: (1) the Kingsley Street rain garden; (2) the East Stadium Boulevard bridges reconstruction project; or (3) the Argo Cascades project. After the funding for those projects is subtracted from funds already accumulated through the Percent for Art program, roughly $1 million is left – which will, by the terms of the council’s resolution, not be spent on public art through April 1, 2013. The future of that $1 million will depend on future action by the council, as recommended by the appointed committee. If the council takes no further action, the $1 million would simply return to be available under the existing ordinance. If the council chose to do so, it could eventually revise the ordinance to end the Percent for Art program, but allow the already-accumulated funds to remain earmarked for art – for example, to provide for maintenance. Or the council could revise the ordinance so that the already-accumulated money would be returned to its fund of origin. Sally Petersen (Ward 2) led off deliberations by offering an amendment to the resolution. The additional resolved clause proposed by Petersen directed the Ann Arbor public art commission to engage in a robust public process for the projects that are already underway. The amendment was accepted as friendly, so the council did not vote on it. Jane Lumm (Ward 2) reviewed the council’s action at the previous meeting – which had resulted in the tabling of two different proposals. She called the tabling “unfortunate” because she didn’t think additional information was needed before acting. She described the public art program as having inherent challenges stemming from questionable legal foundations. One of challenges is the amount of flexibility in the use of the funding – which must be used to purchase permanent art that’s linked to the “theme” of the funding source. Lumm felt the city should focus its efforts on encouraging private donations for public art. If the council wants to have a conversation about the public funding of art, then there should be a clean slate, she said. She noted that “a couple of us” [Lumm and Sumi Kailasapathy (Ward 1)] had been ready to act at the previous council meeting – to repeal the ordinance. Lumm did not think that the resolution to suspend temporarily the funding of new art was being responsive to the community. Marcia Higgins (Ward 4) responded to Lumm by saying she appreciated her viewpoint. Higgins said she felt the resolution is being responsive. The council is often told it’s not clear about what it’s trying to do, but it’s now directing a committee to “go off and explore all these opportunities,” Higgins said. She felt that it’s important to suspend the funding of new art while that exploration is going on, and at the same time watch the process for projects already underway – which Petersen’s amendment did, Higgins said. As far as needing a clean slate, Higgins felt that one possibility was for the committee to come back with a recommendation to the council to completely get rid of the Percent for Art program and start fresh. The committee will look at all the options, she said, adding that she felt it’s time to take a hard look at it. She hoped the committee would not simply say that it was going to “tweak” things. Maybe it’s time to wipe the slate clean and enact a new ordinance, Higgins said. She was willing to give a committee time to do that, so she’d be supporting the resolution. 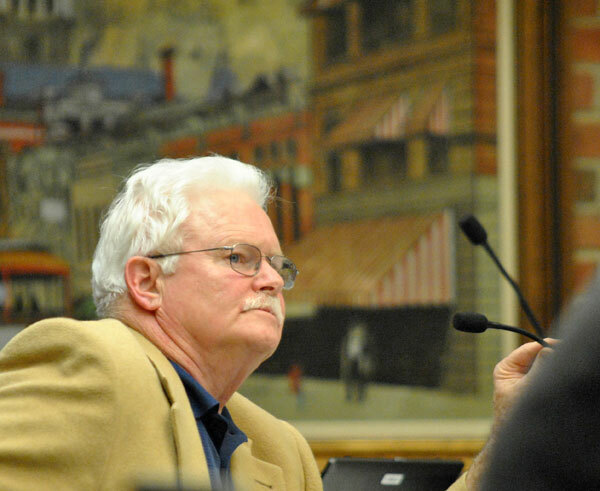 Chuck Warpehoski (Ward 5) picked up on the fact that a “whereas” clause in the resolution stated that the city council “has appointed a committee” – but to that point no committee had been appointed. Mayor John Hieftje indicated that the appointment would happen a bit later in the meeting. Warpehoski then alluded to some advice from Sun Tzu’s “Art of War” to convey his view that the instructions from the council to the public art commission had not been clear: “If the instructions and words of the command are not clear and distinct, if the orders are not thoroughly understood, then the general is to blame.” By way of background, the quote from Sun Tzu continues: “But, if orders are clear and the soldiers nevertheless disobey, then it is the fault of their officers.” Sun Tzu illustrated what he meant by asking the commanders of the king’s concubines to have them perform a precision drill. When the concubines laughed at him, he explained the drill a second time. When they laughed at him a second time, he ordered the two commanders of the concubines beheaded, and replaced. When they were asked to perform the drill a third time, they did so perfectly. Warpehoski felt that some of the tension about the public art program could be traced to a question of clarity of instructions from the council about how the public art commission was expected to go about its work. He said he’d support the resolution because there was a reasonable case to be made that the council had, until that point, not give the public art commission clear enough direction. Warpehoski hoped that the committee would do three things to help make a public art program more defensible: (1) stronger community involvement; (2) stronger community participation in the creation of the art; and (3) community funding. He’s heard that the public art program in Toledo leverages its funds three or four times over to get private donations. He supported the resolution in the spirit of providing greater clarity. He hoped that the public art commission would focus on doing an amazing job on the projects that are still moving foreword. Margie Teall (Ward 4) said she was hesitant to support the resolution. She was concerned that whatever conversation is currently taking place at the public art commission would be stalled. She worried about a possible chilling effect on ideas that are coming forward right now. Teall was also concerned about Petersen’s amendment – because she thought it reflected micromanaging by the council. For example, she felt that there have, in fact, been opportunities for public input. She pointed to public input that had been collected on the East Stadium bridges art project. She again called the resolution micromanaging exactly what the public art commission is supposed to do. Teall also worried about the amount of staff time it would take for Aaron Seagraves, who is the city’s part-time public art administrator. Teall pointed out that there’s never been a prohibition against private funding, but perhaps more of that could be encouraged. She hoped that if the committee comes back with a recommendation simply to tweak the existing program, that would also be acceptable to the council. If the committee came back with a more general change, after looking at how public art programs are funded in other municipalities, she’d also be interested in looking at that. But she would not support the resolution because she felt it would have a chilling effect. Mike Anglin (Ward 5) indicated he’d support the resolution so that further study can take place. Reflecting on the past history of the council’s repeated consideration of changes to the program, he said that the council has been of two minds. He had thought that the ballot proposal for a millage was a good idea, because it set a fixed amount, and put arts funding on a basis other than using utility funds, which many people had concerns about. However, people had voted that proposal down. But Anglin felt that the outcome might have reflected some confusion on the part of voters. He hoped that the committee could provide clarity. He contended that, “All of us have said already publicly that we do support public funding of art.” That’s the basis of a consensus, he concluded. Sabra Briere (Ward 1) described herself as “not the biggest critic of the Percent for Art program” but she had felt dissatisfied for some time with the process. She was concerned that a significant amount of money went into the fund before the public art commission knew how to handle the money. She said the commission has been playing “catch up” for five years, because of the mechanism the council had created. That mechanism had generated a large fund, but it had taken a year for the commission to develop bylaws. She’d attended meetings and listened to them speak about how they plan to do what they’re doing. Briere said the commission had been “a little bit muddled” in its communication to the council. There’s a tendency to blur the distinction between public art and the funding of public art, she said. That led to confusion about which pieces of art are publicly funded, and which were donated. A public art commission existed before the creation of a public art program, Briere said. It’s the council’s responsibility to take a look at what it’s asked this group of people to do and how the council would like them to do it. It’s important to consider whether the mechanism the council had given the commission is the best possible mechanism to meet the council’s goals – so the council needs to be clear about what its goals are, she concluded. Teall, responding to Anglin’s remarks, noted that the question of forming the committee was not before the council right then. What the council is deciding is the suspension of funding. Hieftje said he didn’t want to have a chilling effect on creativity. He pointed out that Lumm’s proposal to repeal the program entirely had left in place the funding that had already accumulated. He urged the commission to keep the current projects alive. He expressed his hope that as the council committee looks at the issue, it can find a way to identify more private funding. He said he was inclined to support the resolution. Lumm followed up on Hieftje’s comments by acknowledging that her resolution would have terminated the program but left current funding in place – because she didn’t want to change the rules in the middle of the game. That was counter to what she’d heard from some members of the community, who said that the money that had been allocated to public art should be returned to its funds of origin. 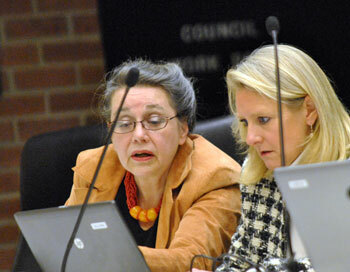 Lumm pointed out that in the absence of any council action, the suspension on the spending of funds ends April 1, 2013. She appreciated what Warpehoski and others had said about leveraging more private support. She said that for her it’s an issue of priorities – and at this point, she felt that there are other, greater public priorities. 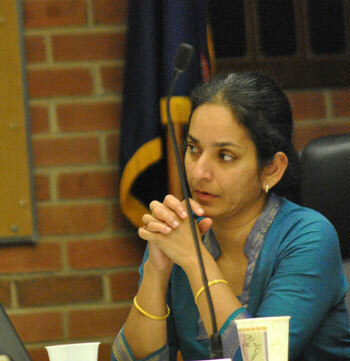 Sumi Kailasapathy (Ward 1) questioned Teall’s description of Petersen’s amendment as “micromanaging” – saying that if the city is diverting millions of dollars to public art, we should not worry about staff time. We should make sure that public art is public in the true sense of getting democratic input. She felt that there’s a disconnect between the art that’s being acquired and the art that people would like to see public dollars being spent on. Stephen Kunselman (Ward 3) indicated support for the resolution. The root issue for him, he said, was the legality of transferring millage and utility money to the public art fund. That funding mechanism had led to the restrictions on the kind of art that can be purchased – permanent and related in theme to its fund of origin. [Artwork funded by stormwater projects would have a water-related theme, for example.] He said he felt sad for the public art commission for the hand it had been dealt. Kunselman then floated the idea of not taking the question to the city attorney, but rather asking the state attorney general for an opinion on the legal status of the city’s public art ordinance. By way of additional background, on April 2, 2012, Kunselman had brought forward a resolution that would have directed the city attorney to write a public opinion analyzing the legal issues surrounding the city’s public art program. That resolution received support only from two other councilmembers – Briere and Anglin. What Kunselman was proposing to do – in asking the state attorney general to weigh in – could be accomplished via a request from an elected member of the state legislature. Upon request from a state representative or senator, the attorney general can issue an opinion answering a specific question – but is not required to do so. Kunselman ventured that if the state attorney general could give a clear answer, then maybe other municipalities in Michigan would follow Ann Arbor’s lead. If Ann Arbor wants to be a leader in the public art world, a clear answer on the legality of the program is needed, he said. Kunselman described the art commission as trying to create a program with their hands tied behind their backs – he’d read the minutes of the commission, he said, as they go round and round talking about how to go about setting up the program. The city council committee appointed to study the city’s public art program gathered immediately following the meeting to review schedules. They determined their first meeting would be at 4 p.m. on Dec. 11 in the south first floor conference room at city hall. Christopher Taylor (Ward 3) indicated he’d support the resolution. He felt that the challenges that the public art commission faced were something not within the capability of an unstaffed citizen organization. He felt the city council had created that management problem. But he pointed out that a lot has improved, and that the commission now has some staff support. The commission also has its procedures up and running. They do focus on obtaining public input and they get it, he said. For that reason, he was somewhat hesitant to support the process amendment added by Petersen. But he appreciated the goal of the amendment. He felt generally, the public art commission had been given “a raw deal” and that they already understand the point about public input. He said he was looking forward to the larger conversation and was interested to see what develops. Hieftje pointed out that each public art project has had a citizen volunteer committee. Hieftje also said he wanted to remind the media that except for $50,000 [which had been associated with the general fund in the creation of the building fund for the municipal center] none of the money used for public art could have been used to fund police and fire protection. Outcome: The council voted to suspend the expenditure of funds accumulated in the public art fund, with dissent from Margie Teall (Ward 4), who requested a roll call vote. The council was asked to give final approval of changes to the city’s ordinance on the storage of vehicles on city streets. Another amendment changed the title of the ordinance section from “Abandoned Vehicles” to “Storage of Vehicles.” The council had given initial approval of the ordinance changes at its Nov. 19, 2012 meeting. During council deliberations, Stephen Kunselman (Ward 3) described the ordinance change as giving the community standards enforcement officers a “sharper tool.” He described one case where a vehicle had been towed and it cost a lot of money for someone who had gone on vacation, and other cases where a car was inoperable, and then just pushed a few feet to comply with the requirement that it be moved. The minor adjustments to the ordinance addressed those situations, he said. But Kunselman cautioned that Ann Arbor was not going out as a city to enforce this aggressively. It’s up to neighborhoods to let the community standards unit know if there are concerns, Kunselman said. Outcome: The council voted unanimously to give final approval of the towing ordinance changes. The council was asked to give final approval of changes to the city’s noise ordinance. The amendments to the ordinance, sponsored by Ward 3 councilmember Christopher Taylor, were related to the now-completed construction of The Landmark at 601 S. Forest, an apartment building located in Ward 3. Construction noise was one of several aspects of the construction activity that came under sharp criticism at the council’s Oct. 1, 2012 meeting from nearby resident Eleanor Linn, who also addressed the council at its Nov. 19, 2012 meeting, when the changes were given initial approval. Thomas Partridge stated that excessive noise should come under the heading of environmental pollution. 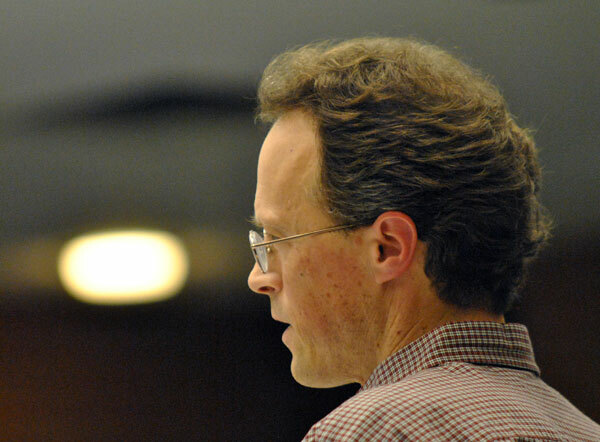 The excessive amount of noise allowed under the current ordinance as well as the amended city ordinance will still leave Ann Arbor as a city under the control of private companies and contractors, he said. Eleanor Linn made only brief remarks, reminding the council that she lives on Forest Court and had previously addressed them, explaining her personal reasons for knowing about the “holes” in the ordinance. She was pleased that it was approved at first reading, and hoped that it passed that evening. Christopher Taylor (Ward 3) described the change to the noise ordinance as a modest quality-of-life change. The experience from the construction project at 601 S. Forest had indicated a “hole” in the city’s noise ordinance that allowed construction to happen on legal holidays, something Taylor described as adding insult to injury. The change to the ordinance also extends the local legal requirements to make clear that responsibility falls not just on the person operating equipment, but also the higher-ups in the organization. Sabra Briere (Ward 1) thanked Taylor for his creative problem-solving. Given the amount of downtown construction, she’s heard about the difficulty of getting construction sites quiet on weekday evenings and mornings, as well as on the weekends and holidays. When she’d looked at the ordinance, she didn’t see any way to make the developers build differently. But Taylor had looked at the ordinance language and thought of a way, Briere said. Taylor deflected Briere’s praise toward residents Eleanor Linn and Marc Gerstein, who Taylor described as having done the work. Outcome: The council voted unanimously to approve the changes to the noise ordinance. The council was asked to consider deficit elimination plans for two of the city’s separate enterprise funds: for the golf courses and the municipal airport. The plan had a clear positive impact on the number of rounds played at the city’s two courses – Leslie Park and Huron Hills – bringing the total rounds played from a low in 2007 of 35,856 up to 54,500 in 2010. That outpaced the number of rounds projected in the 2008 deficit elimination plan. A slight dip in 2011 to 49,203 rounds has been followed by stronger numbers again in 2012, with 55,135 rounds through Nov. 12. But that compares with 58,571 rounds played back in 2003. Leslie is now closed for the season, but Huron Hills will stay open in the winter as weather permits. On the metrics used by the state treasurer’s office to evaluate a municipality’s funds, however, the golf enterprise fund is still in a negative position. Those metrics are: loss with depreciation, working capital, and unrestricted net deficit. [.pdf of golf enterprise fund data from pages extracted from the comprehensive annual financial report from 2007-2011] The city’s figures for the golf fund’s performance on a purely revenue and expense basis show that it’s improved from the 2008 fiscal year – when it needed a $507,000 subsidy from the general fund – compared to 2012, when that amount was reduced to $271,000. The current unrestricted deficit in the golf fund of $164,436 is the difference between the general fund subsidy over the last five years and the losses totaling $2,252,104. By moving the golf fund back into the general fund, the city expects to save on an accounting basis about $20,000 a year for the general fund, with that amount increasing to $120,000 when the golf fund’s debt is paid off, starting in fiscal year 2016. The accounting savings is not due to the lack of a municipal service charge (MSC) to golf once it’s moved to the general fund – because the general fund does not recognize that kind of charge as revenue. [The MSC is how the city distributes the burden of “administrative and overhead” costs to those parts of the city’s operations that cause the existence of those costs. The MSC to golf in FY 2013 is $101,000.] The accounting savings comes from the fact that depreciation is not an expense in the general fund, while debt principal repayment is an expense within the general fund. In FY 2013, depreciation is $140,000 and debt principal repayment is $115,000. The council’s Dec. 3 resolution on the golf enterprise fund included a similar proposed action on the airport enterprise fund – which also shows a deficit, due to the classification of internal loans as unrestricted instead of restricted. The city’s plan for eliminating the deficit for the airport enterprise fund is simply to continue to make payments toward the outstanding balance, which is currently $943,659. On this deficit reduction plan, the airport fund will remain a separate enterprise fund. Jane Lumm (Ward 2) reviewed much of the history of the golf fund and characterized the move to the general fund as a way to make apples-to-apples comparisons between golf and other recreational activities. Mike Anglin (Ward 5) asked if moving the golf fund back into the general fund had been part of the original deficit reduction plan. City administrator Steve Powers responded by describing the resolution the council was considering as complying with a current state treasurer’s requirement. So moving the golf fund to the general fund was not tied to a previous deficit reduction plan, he said. Left to right: Mike Anglin (Ward 5) and city administrator Steve Powers. If the golf courses were not moved back into the general fund, Anglin wanted to know if golf would be part of the parks system. He feared that it might appear to save some money by moving the golf fund, but that it might stress the parks system. He felt that the park advisory commission should have reviewed the proposal. He felt it was strange to ask PAC to simply “accept this park” back into their budget. Anglin still indicated dissatisfaction with the resolution. He referred to wanting to “pay the bill off to the state” and resolve the issue, because he didn’t want to come back to the same issue. He asked Bahl if he saw the parks budget as being burdened by taking on the golf courses. Bahl indicated that he did not see it that way. Sabra Briere (Ward 1) said that Anglin’s concern is real – that if the move were adding labor or costs to the parks system, it might affect the ability of the park advisory commission to manage the system. Briere’s biggest concern was that clear direction be given that revenues from golf don’t disappear in the rest of the budget, but remain to be reinvested in the golf courses. She put the question of potential financial stresses on the parks system in the context of the possible development of parks at 721 N. Main or on top of the Library Lane parking structure, or undertaking renovations at Liberty Square. Stephen Kunselman (Ward 3) indicated his support for the resolution, characterizing it as administrative, and not affecting operations. It doesn’t take from the golf courses and give it to the canoe liveries. He observed that for a few months out of the year the golf courses provide a venue for other actives – like sledding and cross-country skiing. Marcia Higgins (Ward 4) praised the parks and recreation staff for the tremendous job they’d done on the golf courses, having implemented all sorts of things the council had asked them to do. Sumi Kailasapathy (Ward 1) questioned whether the golf courses were actually taking losses, venturing that only after the municipal service charge and the IT fees were applied did the courses show losses. Bahl explained that while the losses were less when the MSC and IT charges were removed, the golf courses still showed a recurring deficit. Bahl agreed with her point that the savings that are realized with the move into the general fund is an accounting savings, not a cash savings. Lumm added her praise to that of Higgins for the work that the golf course staff did. Anglin observed that the city monitors the cost per visit for its recreational facilities. He continued by saying that he’d heard golf described as elitist, but he wanted the golf courses to receive the attention they need from the park advisory commission. He said he wouldn’t support the resolution, because he felt there were some hidden things in there, and he raised the specter of the need to sell a golf course to temporarily satisfy a financial need. Mayor John Hieftje responded to Anglin’s comments by noting that it’s not possible to sell a park without a popular vote. 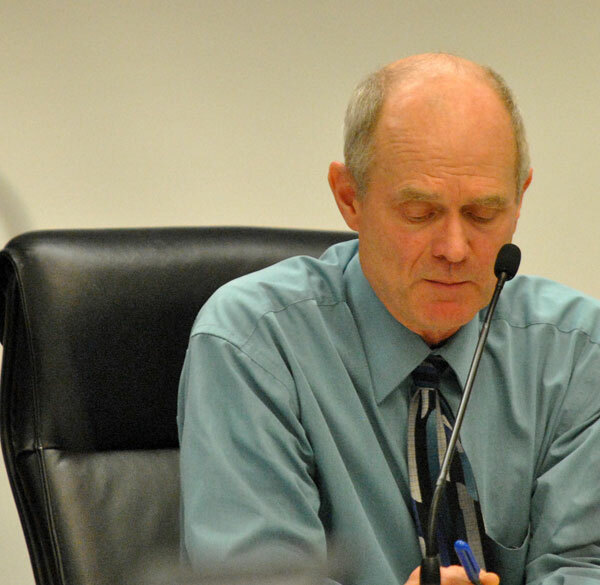 Chuck Warpehoski (Ward 5) indicated he’d support the resolution for the same reason Anglin appeared to oppose it – if golf operations are in an enterprise fund, that brings extra scrutiny. By moving golf operations into the general fund, the golf finances get evaluated in the same way as other recreational facilities. The resolution protects golf courses more than they’d be protected with their finances handled in an enterprise fund, he said. Outcome: The council voted to move the golf fund back into the general fund and to continue making payments on the loan for the airport enterprise fund. Dissenting was Mike Anglin (Ward 5). The council was asked to approve changes to the Packard Square project, which aims to redevelop the former Georgetown Mall site by constructing a four-story, 230-unit residential building with ground floor retail.. The proposed changes would alter the facade of the building by reducing the number of balconies by one-third, replacing some brick with Hardi-board siding, changing windows, and changing the color of the siding. The changes to the building that the council was asked to approve were motivated by a change to the upper level residential portion of the Packard Road facade. It was moved 10 feet to the east to make it line up with the front stairwells. That also increased the footprint of the building by 4,720 square feet. Margie Teall (Ward 4) led off council deliberations by saying that when she compared the revised drawings to what was originally approved, “I just don’t like it.” She characterized it as now looking like a dorm. She’d liked the previous articulation of windows. She indicated it was her understanding that some of the balconies had been removed due to privacy concerns. But she said she’d prefer to postpone consideration of the approval so that neighbors can weigh in on revisions. Bruce Measom, who spoke on behalf of the developer, explained that the original drawings look nicer because they’re actual renderings with shading and trees that gave it a three-dimensional effect. The idea was to get the new drawings in front of the council quickly, so there wasn’t time to make them prettier. He described the material to be used as a standard Hardi-board product – a fiber-cement board that has a stone-like look to it. Stephen Kunselman (Ward 3) ventured that it was a similar product to what had been used for the construction of City Place, a residential development on South Fifth Avenue. Teall said that on previous occasions, developers have brought samples of products. She indicated she was hesitant to move forward not knowing if it would be a durable product. 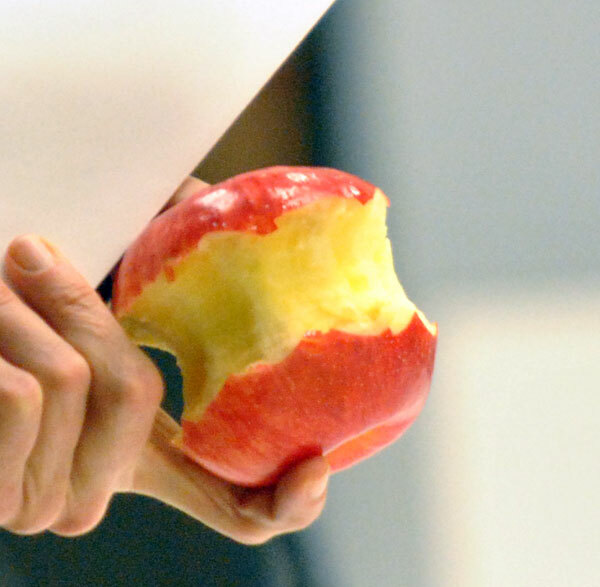 Responding to the explanation that the revised drawings didn’t include the kind of shading that the previously approved drawings had, she said she wanted to see apples-to-apples drawings with the same kind of shading. Teall said she didn’t see the attraction of the different colors. Marcia Higgins (Ward 4) alluded to the city’s design guidelines that deal in part with issues of how to break up a single facade through the use of color. [By way of background, the design guidelines apply to areas zoned D1 and D2 in the downtown. The site of the Packard Square development is not in the downtown.] Higgins felt that the drawings indicated an adherence to those design principles, but she did not have a problem postponing it. She wanted to know if the revised drawings had been sent out to the neighborhood to look at the changes. City planning manager Wendy Rampson indicated that the revisions don’t require a public hearing and don’t need to come before the planning commission. Nevertheless, Higgins wanted to make sure some feedback was obtained from the neighbors. Bruce Measom of The Harbor Companies answered questions on behalf of the Packard Square developer. Sabra Briere (Ward 1) echoed the comments from Higgins about breaking up the facade so that it does not give the impression of “one giant building.” In the new drawings, the “depth” changed – which Briere attributed possibly to the disappearance of some of the windows and the removal of some of the balconies. The lack of balconies gave it a much “flatter appearance,” Briere said. And the lack of windows made her “mourn” the lack of those windows for the future residents. She asked about the red and blue stripes on certain facades on the ground floor. Measom indicated they were awnings corresponding to retail use on the ground floor. Kunselman indicated some puzzlement that the building materials were being changed, but for some reason the color was being locked in. “As far as I know, we don’t mandate color,” Kunselman said, noting you can always paint it a different color. All the colors could be changed in the future, he ventured. [The colors in question have names like Evening Blue, Alpine Frost, and Monterey Taupe.] Rampson indicated agreement with Kunselman that the city was not interested in enforcing color. Measom noted that the material specified was a fiber-cement panel, and that’s what Hardi-board is. Kunselman ventured that the footprint of the building had also changed. The previously approved drawing gives the impression that there’s more depth. Measom ventured that what Kunselman was perceiving was that the original version was “touched up more” to convey the depth of the building. He reiterated the same point he’d made previously that the revised drawings were done quickly to get them in front of the city council. He noted that the project’s building plans and civil engineering plans had been submitted for approval. The grading plans are almost ready for submittal. The developer had spent over $40,000 for building permits in the last two weeks, Measom said. So the developer wanted to get the new drawings in front of the council as soon as possible. The revised drawings correspond to “the same in-and-out,” he assured Kunselman. He allowed, however, that at the very front – the “finger of the U that’s closed to Packard” – was moved a few feet. Kunselman indicated that to him, it looked like an attempt at “value engineering.” Kunselman said he was not too keen on the colors – even though it would not matter too much to him, because he is colorblind. Kunselman indicated he’d support the postponement. Christopher Taylor (Ward 3) said the colors were, for him, neither here nor there. The previous drawings had more visual activity to them, he said. Chuck Warpehoski (Ward 5) asked about the impact of a postponement on the project timeline. Measom indicated a preference that the council approve the revisions that night, but also indicated that he could live with a postponement. He said that some three-dimensional drawings are currently being prepared – and he’d seen some preliminary versions of those. The drawings could be brought to the council when the council took up the issue again, he said. Teall returned to the fact that she’s dissatisfied with the colors. She also complained about the shapes of the windows, characterizing them as looking like windows for dormitories. Teall asked if it might be possible to postpone for longer than just two weeks. Rampson indicated that she could not approve the developer’s administrative amendment, which would allow permits to be issued, until the council gives its approval. The permits have been submitted for review, Rampson explained, and one of the steps to that review is to make sure that construction plans match the elevation drawings. That couldn’t be done right now, because they don’t match, she said. Teall pointed out that the derelict Georgetown Mall building is still standing. Kunselman ventured that the developer could still pull demolition permits. Rampson indicated that financing is an issue, based on what she’s heard from the developer. Teall said that due to a possible family issue, she didn’t anticipate being able to attend the council’s Dec. 17 meeting. The council then considered postponement of the issue until Jan. 7, 2013. Jane Lumm (Ward 2) wanted to know what the impact of the longer postponement would be on the project. Measom quipped that between now and then is the “fiscal cliff,” so it’s anybody’s guess. But if that’s what had to be done, that’s what they’d do, he said. Hieftje told Measom that the perception was that the building has been “dumbed down.” He encouraged Measom to take that sentiment back to the design team. Higgins recommended that the demolition permits be pulled and demolition be started. Measom indicated that if that were possible, it would be done. Higgins pointed out that she’d heard this for a long time and she was not inclined to keep extending the timeline when there was no return for the city. Outcome: The council voted to postpone consideration of the changes to Packard Square until Jan. 7, 2013. The council was asked to consider three petitions of the Washtenaw County water resources commissioner for three stormwater control projects totaling $1.07 million. A proposed project on South Fourth Avenue – between East Huron Street and East Liberty Street – will reconstruct the street using a traditional road surface, but will manage stormwater with infiltration basins under the road. The stormwater part of the $870,000 project will cost $320,000. A similar project on South Forest Avenue – from South University to north of Hill Street – will have a total price of $688,500, with the stormwater component costing $454,400. A third project for which the city has petitioned the county water resources commissioner is a citywide tree planting project costing $300,000. Between 650 and 1,000 trees would be planted in the fall of 2013 and spring of 2014. All of the projects are eligible for low-interest state revolving fund (SRF) loans, and have been classified as “green projects,” which could lead to 50% loan forgiveness. Sabra Briere (Ward 1) noted that responses from the city staff to written council questions had allowed the council to learn that it’s possible to create a system whereby the stormwater would be led under the traditional road surface, where it could infiltrate into the subsoil, without using any permeable pavement. She appreciated that the staff were looking at stormwater issues for each individual project. Jane Lumm (Ward 2) thanked the staff for their answers to questions about the pavement. On the tree-planting project, Chuck Warpehoski (Ward 5) noted that the project does tie in to the city’s urban forest plan. He also highlighted the fact that as a “green” project, there’s potential for 50% loan forgiveness. 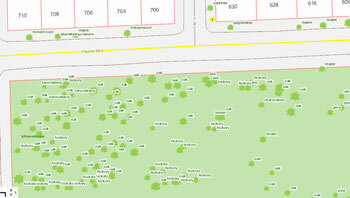 Screenshot from the city of Ann Arbor’s online tree inventory, showing a preponderance of oak trees in the northern part of Allmendinger Park. Mike Anglin (Ward 5) asked the city’s water quality manager Jennifer Lawson to come to the podium to answer questions. She noted that the $300,000 project budget, if 50% of the loan is forgiven, would result in a cost of about $150 per tree – which includes the cost of planting and a one-year warranty. Judged by industry standards, she called that a really good deal. Anglin said that with respect to the new urban forestry initiatives, he’d heard some complaint that the types of trees being planted were more of a flowering variety as opposed to those that would provide large canopies. He wanted residents to be able to select the tree they want – reasoning that it could result in better care provided to the trees by the nearby residents. Lawson responded to Anglin by saying that the city has an approved list of street trees that can be planted. The majority of trees planted in the right-of-way have constraints like overhead utility lines or lawn extensions that in some areas are only 4-5 feet wide. That limits the kind of species that can be planted. For the citywide program, Lawson explained, gaps and holes are considered. Staff also look at industry standards on likely diseases that will hit next or the next big insect that the city needs to worry about. In fact, she said, it’s maple trees that are vulnerable now. So the city does look at species management so that the trees that are planted will live for 50-60 years. Marcia Higgins (Ward 4) raised the issue of warming trends. Lawson confirmed that the city incorporated climate adaptation as a consideration in selecting species to plant. Subsequent back-and-forth between Higgins and Lawson – as well as Craig Hupy, public services area administrator – highlighted the fact that the council was approving the petition to the water resources commissioner, not allocating any money. The Washtenaw County water resources commissioner would be applying for the loan on the city’s behalf – but the city is not obligated to take the loan if it’s approved, Hupy explained. Stephen Kunselman (Ward 3) called the project very exciting. He noted that some of the trees planted last year had died. He wanted to know if they were under warranty. Lawson indicated that the trees are under a one-year warranty contract, so the contractor is responsible for one year of watering and tree maintenance. After one year, the city will go out and evaluate the tree. At that point, if it’s not “in a living format,” the contractor will replace the tree, she said. 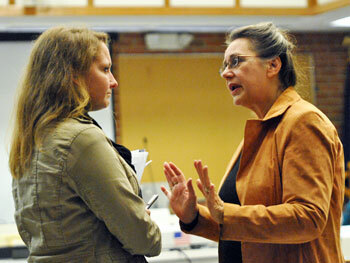 Left to right: city of Ann Arbor water quality manager Jennifer Lawson and Sabra Briere (Ward 1). Briere is not explaining how the pass interference rule applies to city council meetings. Kunselman wondered how the city planned for climate change: At what point do you make a decision to plant different trees? Lawson indicated that this was something being weighed currently by the staff: Should changes be made now or in five years? She noted that as part of the stormwater management system, trees are a different kind of investment from a pipe. Trees grow in benefit as they grow in size, she said. Responding to questions from Kunselman, Lawson said that communication with property owners about trees being planted in the right-of-way takes multiple forms: letters; door hangers; and the event of a tree being planted. She said that the city also circles back with the automated email notification system for which people can sign up, to remind people to water street trees. The city also uses social media for that, she said. Outcome: The council voted separately and unanimously on all three projects – to approve the petitioning of the water resources commissioner. The council was asked to approve the purchase of about 1,250 additional curbside waste collection carts this year, and about 2,500 carts a year for the next three years. The carts, which are being supplied by Toter for $65,500 this year, will add to the existing 55,000 carts in circulation. The carts were first implemented seven years ago, and the city expects to start seeing more frequent need to replace them. Over the next three years, the city expects that each year it will need to purchase 1,500 recycling carts, 400 compost carts and 600 trash carts. The contract through which the city wants to purchase the carts is through the Metro Waste Authority, at a cost for the base carts that is slightly higher than in an alternate agreement that’s available through the National Intergovernmental Purchasing Alliance. When the cost of an RFID tag, labels, assembly and shipping are added in, the difference in the cost per cart in the two agreements is smaller: $55.01 (96 gallon), $49.86 (64 gallon) and $39.97 (32 gallon) in the Metro Waste Authority contract compared with $56.63 (96 gallon), $48.47 (64 gallon) and $39.77 (32 gallon) in the National Intergovernmental Purchasing Alliance. The cost of adding an RFID tag is $0.75 per cart. The city would like to use the RFID tags to monitor set-out rates for recycling carts, in order to target education efforts and to manage the collection routes. Outcome: The council voted unanimously, without discussion, to approve the Toter cart purchases. The council was presented with assignments to various internal committees – as well as the council’s appointments to other bodies. It was the second meeting of the new edition of the council, following the Nov. 6 elections. The departure of Tony Derezinski, Sandi Smith and Carsten Hohnke from the council meant that some changes to committee assignments had to be made. The budget committee saw no changes from last year. Members are Mike Anglin, Sabra Briere, Marcia Higgins, Jane Lumm, and Christopher Taylor. Added to the audit committee to replace Sandi Smith and Carsten Hohnke, as well as Sabra Briere, were Chuck Warpehoski, Sumi Kailasapathy, and Sally Petersen. Other members of the audit committee are Stephen Kunselman and Margie Teall. Sally Petersen was added to the council administration committee to replace Tony Derezinski. Other members of that committee are Marcia Higgins, Margie Teall, Christopher Taylor, and John Hieftje. Added to the labor committee to replace Sandi Smith was Stephen Kunselman. Other members of that committee are John Hieftje, Jane Lumm, Marcia Higgins and Margie Teall. John Hieftje was added to the council rules committee to replace Sandi Smith. Other members of that committee are Sabra Briere, Marcia Higgins, Stephen Kunselman, and Christopher Taylor. Tony Derezinski had served as the council appointee to the city planning commission, a responsibility that will now be taken over by Sabra Briere. Jane Lumm became the council’s appointee to the insurance board of review, replacing Derezinski. Lumm will also fill the position of liquor license hearing officer. Taking Derezinski’s spot on the liquor license review board will be Sumi Kailasapathy. The council appointments to the environmental commission, greenbelt advisory commission and planning commission were made through separate resolutions. Sandi Smith’s city council slot on the housing and human services advisory board (HHSAB) will be filled by Sabra Briere. That body has been tasked by the council – through a resolution passed at the council’s Nov. 19, 2012 meeting – to provide a recommendation on the city’s living wage ordinance. The council considered, but postponed until February 2013, a change to the living wage that would exempt nonprofits that hold contracts with the city to provide human services. 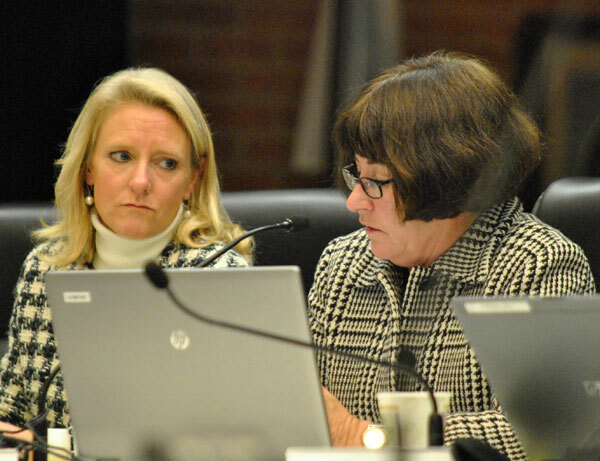 During communications time, Jane Lumm (Ward 2) – who brought forward the living wage ordinance revision, and serves as a second city council liaison to HHSAB – gave her colleagues an update on the status of that proposal. Since the council’s postponement, she’d met with Mary Jo Callan, head of the city/county office of community and economic development, and other staff. The plan at this point is to gather additional information, Lumm said, by surveying human services nonprofits and holding focus groups with them. A University of Michigan residential college class it taking on the question as a class project, Lumm reported. Callan’s office will be providing guidance and direction on the project. So Lumm anticipated an additional postponement would be required until March or April. The HHSAB also got an additional citizen member at the council’s Dec. 3 meeting, when the council voted to appoint Tim Colenback to the board. Colenback is assistant dean of student services at the UM school of social work. His appointment was made in a one-step process – instead of the standard nomination at one meeting and confirmation at a subsequent meeting. Sally Petersen replaces Sabra Briere as the council appointee on the zoning board of appeals. Nickolas Buonodona was nominated at the Dec. 3 meeting as a citizen appointment to complete the remainder of Carol Kuhnke’s term. Kuhnke resigned after winning election on Nov. 6 as judge of the 22nd circuit court. Marcia Higgins praised Kuhnke’s record of service on the ZBA, which Kuhnke had chaired. The council was asked to consider Patti Smith’s nomination to serve as a citizen on Ann Arbor’s environmental commission for a three-year term. 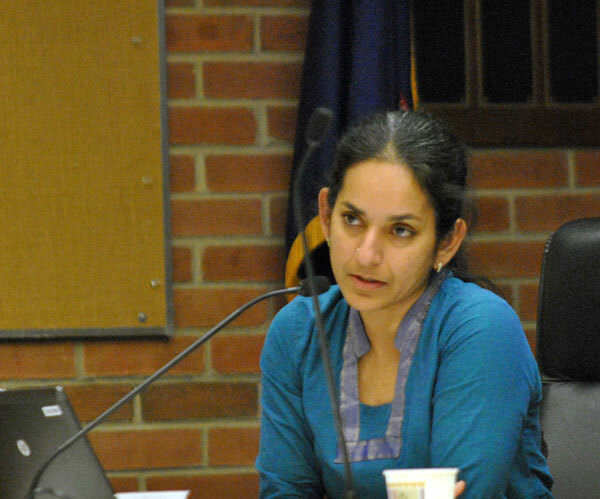 Sabra Briere (Ward 1), the current Ann Arbor city council appointee to the commission, nominated Smith during the council’s Nov. 19, 2012 meeting. Smith’s educational background is as an attorney, and she now works in the field of special education. Unlike the majority of nominations to city commissions and boards, which are made by the mayor and confirmed by the city council, the environmental commission nominations are made by the council. At the Dec. 3 meeting, Briere noted that Smith is not an environmentalist but a general citizen representative. Briere described that as a good thing. Outcome: The council voted unanimously to approve Patti Smith’s appointment to the environmental commission. Also its Dec. 3 meeting, the council adopted its rules and meeting calendar for the coming year. The meeting schedule adhered to the same pattern: first and third Mondays of the month, except for holidays, when the meeting is held on Tuesdays. And when an election is held on a Tuesday after first Monday of the month, that meeting is moved to Thursday. There were no changes to the council rules from the previous year. Outcome: The council voted separately and unanimously on all the appointments and other council housekeeping items. The council considered a resolution designating Craig Hupy, public services area administrator, as the city’s street administrator for purposes of signing contracts with the Michigan Dept. of Transportation. The designation of Hupy in that role – instead of Homayoon Pirooz, former head of project management with the city – highlighted the fact that Pirooz has retired to take a job with the city of Evanston, Ill. as city engineer. Pirooz started working for the city of Ann Arbor in 2000. Based on the agenda of the Nov. 12, 2012 Evanston city council agenda, Pirooz will be living initially in a one-bedroom apartment on the second floor of the city’s service center. Outcome: The council voted unanimously to Craig Hupy as the Ann Arbor street administrator. The council considered final approval of a set of fairly technical revisions to the pension ordinance and the retiree health care ordinance, which had been part of the collective bargaining process with the Teamsters Civilian Supervisors, Teamsters Police Deputy Chiefs, and Teamsters Police Professional Assistants. During the public hearing on the subject, Thomas Partridge told the council that he had been a recent Democratic Party candidate for the state legislature. And as a candidate he’d been committed to positions that favor ongoing employee benefit packages, and health care of all forms that protect the health of employees. He ventured that Christ would not advise that we leave public employees without the protections they need. Responding to Partridge’s commentary, mayor John Hieftje expressed his view that members of the city unions have benefits better than those of most Americans. Outcome: The council voted unanimously to approve the ordinance changes without discussion. A vote taken by the council at its Nov. 8, 2012 meeting – to opt out of a newly incorporated Act 196 transportation authority – prompted two high school students to attend and address the council. Real-time online reviews were positive. Shoham Geva introduced herself to the council as a senior at Skyline High School in the communications, media and public policy magnet program. She reminded councilmembers that the previous month they’d voted to halt the city’s involvement with the countywide transit plan. As one of the 60% of 17-19 year-olds who don’t have a driver’s license, and as an everyday user of transit, she wanted to remind the council of the impact transit has on the community. Ann Arbor is filled with opportunities for high school students, she said. The University of Michigan, the Ann Arbor Area Community Foundation, the Neutral Zone and other organizations give students like her the chance to do amazing things. Ann Arbor is a place where teens are trusted to curate music festivals, serve on boards of local organizations and start businesses, she said. Those are the kinds of experiences that change lives and cause teens to stay in Ann Arbor, becoming the kind of invested, involved members the community thrives on. For her, that experience would not be possible without the Route #18 bus that runs from Skyline High School, the Route #7 bus that runs from Pioneer High School, and the Route #3 bus that runs from Huron High School. For her and many others, she said, “We need that bus.” As a 17-year-old living in an affluent community, in a well-off two-parent home with two cars, she still has no other options. And every day hundreds of high schoolers use the bus to get around. “That bus route has literally changed my life,” she said. Public transit does make an impact, she said, so she encouraged the council to continue to explore that impact. Alex Kim also introduced himself to the council as a Skyline High School student in the communications, media and public policy magnet program. As a student without a car, he relies on the transit system to get around town. Whether it’s for the art fairs, Top of the Park, a movie at the Michigan Theater, or a program at the Neutral Zone, the bus system is a main reason he’s able to do everything he does. While he knows people from whom he occasionally can get a ride, there are other people who aren’t so lucky, he said. He was disappointed in the 10-0 vote to opt out of the newly incorporated transportation authority. While the plan might not have been everything that was desired, the idea of improving the current system should be considered, he said. Public transit is not a waste of money, he said – as it gives students and seniors freedom of movement. The community benefits from those people going places, he said. Kim asked the council to continue to look for ways to improve how we move from place to place. Odile Hugonot-Haber told the council she’d read an article in The Ann Magazine by Ellen Schulmeister, executive director of the Shelter Association of Washtenaw County, which runs the Delonis Center. Hugonot-Haber reported that Schulmeister’s piece described how there are 1,700 homeless people in Washtenaw County, and on average 200 have no shelter – due to the scarcity of affordable housing. Many homeless people work, she continued, but can’t afford housing. She reminded the council that the homeless are not helpless. She pointed out that former residents of Camp Take Notice went to New Jersey to help with the aftermath of Hurricane Sandy. That showed that the homeless have a heart, she said. But the city has no heart, Hugonot-Haber continued, because homeless people have no place to hang out except the library. And the ability to spend time at the library, she said, doesn’t give them the services they need. She reminded councilmembers that over the course of the last year they’d been addressed by two young women – Orian Zakai and Alexandra Hoffman – and the two have been teaching an art class at the Delonis Center. They’ve been discouraged after a year of work, Hugonot-Haber said. Their group had focused on trying to convert the 721 N. Main building to a day warming shelter, because it’s a building full of old furniture, she said. But now, the city’s plan is to destroy the building to make a park out of it. [Later in the meeting, Sabra Briere (Ward 1) corrected this statement, pointing out that there are two buildings in the floodway that will be demolished, but a third one is being recommended by a task force to be maintained on the side.] Hugonot-Haber allowed that she’s fought for parks in other locations [like the top of the Library Lane parking structure], but the 721 N. Main building is a good sound building that could be updated and could serve as a day shelter, she said. She told the council they could be a part of the solution. “So let’s do it,” she concluded. Haber said he’d tried to be involved with that process but has been dissatisfied with it. The space above the new underground parking garage on South Fifth Avenue should be looked at as a space where the community can gather, he said. He was somewhat disturbed to hear members of the Connecting William Street’s leadership outreach committee say how pleased they were with the robustness of their public engagement process – because they didn’t consult those who wanted that parcel to be considered as a community gathering place, he said. During council communications time, Sabra Briere (Ward 1) clarified that the main building at 721 N. Main is not slated for demolition. Two other buildings at that site are in the floodway and will be removed. The technical committee reviewing that site has tentatively agreed that keeping the building is prudent until a use for the rest of the land is determined, Briere noted. She indicated that the council would have an item on its Dec. 17 agenda based on the North Main corridor task force‘s recommendation for the 721 N. Main property. What’s important to understand, Briere said, is that there’s a deadline for a grant application at the end of December – which is why the task force has moved so swiftly. Briere noted that after making a recommendation for 721 N. Main, the task force will focus on the rest of its tasks, which includes looking at connections across Main Street and the railroad, connecting parks, and making recommendations for the best use of the old MichCon site on Broadway. Briere ventured that it’s a lot for the task force to do between January and July. City administrator Steve Powers announced that the city council would hold a budget planning session on Dec. 10, from 4-11 p.m. in the jury room of the Justice Center. More details on that would be forthcoming, he said. 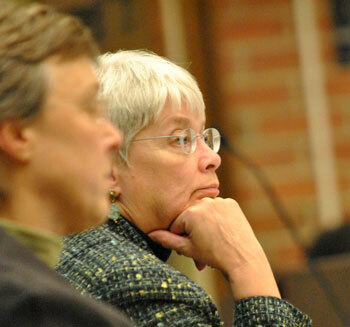 Marcia Higgins – who’s chair of the budget committee, which has been planning the Dec. 10 session at its meetings over the last two months – noted later in the council meeting that an emergency contact telephone number would be set up so that councilmembers could turn off their computers and cell phones for the duration of the planning session. The Justice Center has airport-style security, so a question was raised about accommodating the public and minimizing disruption. Powers is working on the logistics for that, but it was indicated that the media would be able to bring electronic devices into the building. During public commentary at the start of the meeting, Thomas Partridge introduced himself as a resident of Ann Arbor and Washtenaw County and of the 18th District of the Michigan Senate and the 53rd District of the Michigan House – for which he noted that he’s stood for public office in the last few years. He was there to advance the cause of justice, liberty and progress for the most vulnerable residents of city, county, state and nation, Partridge said. He posed the question: What would Christ advise with respect to housing the homeless? What would Christ advise on policies for those who lack money for basics like food and medical care? During public commentary at the conclusion of the meeting, Partridge said he was speaking out of frustration that after 20 years as a dedicated advocate for those needing representation, his calls for action had not been heeded by the city’s leadership. He was critical of mayor John Hieftje’s leadership. Kermit Schlansker told the council that there’s a tremendous need for invention to bolster our economic system and create the mechanisms of a sustainable society. Most citizens do work that does not contribute toward sustainability, he observed. He described various kinds of systems that need to be built, including solar energy, windmills, bio-digestive systems, and methods for planting trees from seeds. He also described his frustration at the fact that it’s difficult to bring inventive ideas to fruition, citing his own ideas on saving the braking energy of cars and his work on a three-piston heat pump. He called on the government to create an energy research farm where entrepreneurs can meet and work on new ideas. Next special meeting: Dec. 10, 2012 at 4 p.m. in the fourth-floor jury room of the Justice Center, 301 E. Huron. The topic is a resolution on state legislation regarding a regional transit authority (RTA). On Patti Smith’s appointment to the Environmental Commission – I mispoke. I’ve privately apologized to Ms. Smith. Patti IS an environmentalist. She isn’t an environmental professional – she doesn’t work for an organization engaged specifically in environmental issues, nor does she hold a degree in environmental science, environmental health, or related fields. She’s like many of us – interested and involved in our community and concerned about ways to make it better. And for that, I thank her. Awww, thanks :) Again, no big deal at all. Thanks for your support!!! Am I the only one in this supposedly liberal town concerned by an ordinance that requires you to prove to the city administrator or his designee that you are complying with the law about parking? IO thought in America that you were presumed innocent until proven guilty. Traffic laws routinely violate the spirit of the constitution, if not the letter. This just makes it one step worse. Is nibbling away at an American ethos worth it for a few parked cars? One question that needs to answered is why hasn’t Steve Postema issued a publicly-disclosed legal opinion on the legality of the One Per Cent For Art Ordinance? Steve Kunselman has hit the nail right on the head that there needs to be a review of the ordinance’s legality. 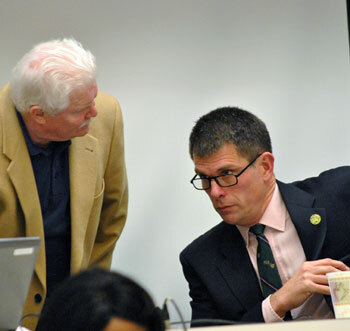 A publicly-filed opinion of the City Attorney is expressly authorized by the City Charter of Ann Arbor – as Jack Eaton has repeatedly pointed out. Seattle in 1973 was the first city to enact a similar ordinance and it was eventually challenged in the courts and that specific law was struck down by the court system in Washington. It had been argued by critics that it was a mechanism to drain money out of the lucrative utilities establishment, its funding source and had no rational ties to that source to warrant a collateral expenditure for art. Even assuming its legality, it has not functioned ideally. Marcia Higgins at a city council caucus a few years back remarked there appeared to be overfunding. A member of the Art Commission herself publicly remarked during a meeting that she was surprised at the high-level funding received by virtue of operation of the ordinance. The capital improvement that gave rise to the Dreiseitl project was the sewer upgrading that cost upwards of $55 million dollars – thus giving rise to an art work which had waste water as its critical theme – which is ludicrous in itself. There was outcry that a foreign artist was retained when the funding could have stayed within our community by hiring a talented local artist. Worst of all, the Dreiseitl project was being undertaken during a period when police and fire funding was receiving significant cutbacks – this was reported on nationally and made the city a laughingstock. Maybe there needs to be a citizen’s group filing a lawsuit to test the legality of the One Per Cent Per Art Ordinance – as occurred in Seattle. Then the City Attorney will have to explain his position to a judge. I applaud Jane Lumm and Sumi Kailasapathy in advocating a repeal of this ordinance. The City Council and the Mayor ignored a clear mandate from Ann Arbor voters in the November general election that they did not want to be forced to pay for public art in the city through taxes and did not end the tax-payer funded Percent for Art program. Why is that? Aren’t the city council supposed to represent the people of Ann Arbor and respond to their wishes? If various people want to have public art in Ann Arbor, these people should pay for it out of their own wallets and purses instead of trying to force their values, beliefs, and self-interests on everyone else in the city who do not share these values, beliefs, and self-interests.